András Fejér, the last-serving founding member of the Takács Quartet, can still make time stand still when he intones his eloquent cello solo lines. But when he is not playing, the clock continues to advance. For 18 years after the 1975 founding, no personnel changed. Then the current first violinist Edward Dusinberre joined in 1993, violist Geraldine Walther took over for Roger Tapping (who entered the foursome in 1995 after the death of Gábor Ormai) in 2005, and Boston luminary Harumi Rhodes accepted a founder’s second violin chair just last year. 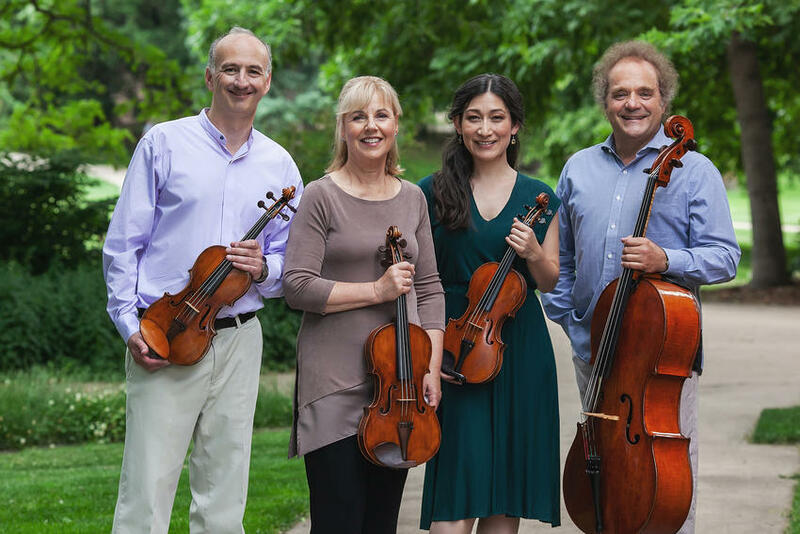 So would a blindfolded Gabor Takács-Nagy have recognized his namesake foursome at Concord Chamber Music Society’s concert on Sunday at the Concord Academy? Not likely in the opener, Haydn’s Quartet in G Major, Op. 76 No. 1. The players seemed to be adjusting to the dry room and warming up rather than engaging with the work, or the crowd, or one another. Charles Burney praised Opus 76 as “full of invention, fire, good test and new effects.” Steven Ledbetter cited the composer’s ability to “…fuse learned counterpoint and popular tune, the serious and the flippant with novel ideas never before found in a string quartet.” We observed old master Haydn as if through dark layers of varnish, with none of the sparkling HIP-inspired wit that younger foursomes find. Tuning in the upper registers took time to solidify. Every time the expansive Adagio sostenuto second movement threatens lugubriousness, fast passages offer lively contrast. Fejér led the chorale-like parts with sumptuousness expression, while the glittering Rhodes seemed to cajole life into her colleagues for the rapid playful bits. The tearoom Menuetto third movement almost smiled, yet never spun. Exuberant rattling and buzzing drew attention to Haydn’s clever modulations in the final Allegro ma non troppo, leaving us with intimations of the original players’ approach. We expect inspiring Bartok from the Takács, considering its Budapest origins and the high repute of its recordings. But in the composer’s Quartet No. 6 (1939), the opening notes of Walther’s viola solo, which should set the sad (Mesto) world-weary tone for the subsequent 30 minutes, neither bloomed nor reveled in theatrical grief. Overall, we got a lived-in battle plan executed with savagery much subdued and nostalgia haunting only intermittently. The music’s sarcasm had edge, but more truculence (also volume) would have set off that tensionless sadness. Grieg’s only essay in the string quartet genre fired up the players; they fully atoned for a disappointing first half. Pleasing audiences if not critics since its premiere, in 1878, this concoction of Norwegian folkishness, gnomes and mountain kings never paled. The players never missed the chance to infuse salon refinement with gripping exuberance, making a stirring case for lyrical romantic impulses. We particularly enjoyed the battle of two against three in the Intermezzo and Dusinberre’s Heifetizan Peer Gyntisms. The presto finale set the cauldron aboil with a dæmonic witches’ sabbath decocted from earlier ingredients. Well-played and well-sold. And congratulations to Michael King, CCMS president emeritus, for his decadeslong collaboration with founding artistic director Wendy Putman. Full houses and friendly volunteers attest to the extent Concordians, and the rest of us, value this enterprise.